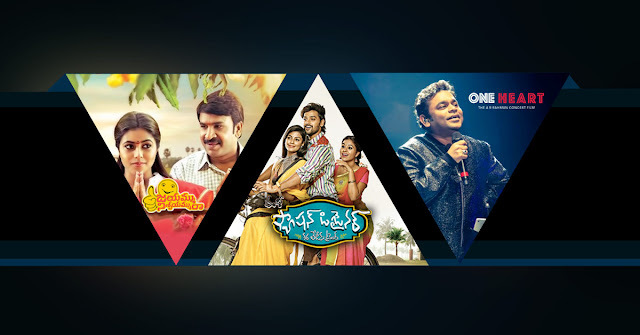 YuppTV Mini Theatre which presents the Indian audience in the US with the latest released Movies from Bollywood, Tollywood, Kollywood, etc., has brought some of the best comedy films of the year for you to watch. The lowly priced films are very recent releases and are blockbuster hits of the year. Except for the A R Rahman’s magical concert film- One Heart, all the three new movies are fully entertaining Comic films. Though not from big stars the films offer enough entertainment to fully enjoy the weekend. Here is a summary of films to help you decide. Check it out. AR Rahman’s music concerts are highly popular in the entire world. The man has gained as many fans in the west as he has in the Indian Sub-continent. This film which is a kind of documentary delivers an insight into the life of the well-known musician and most importantly, his concerts. The film covers the basics of how the concert of this renowned musician is planned from the scratch and also introduces us to the most important contributors to the band like Jonita Gandhi etc. The film essentially offers a feel of live music to the people who have never experienced a concert. With the right sound system, the film offers a truly enjoyable music in addition to the insights on the life of the Maestro. With the highly revered screenwriter, actor, director and producer Posani Krishna Murali, Brahmanandam, Krishna Bhagawan and some amateur actors, Nenu Kidnap ayyanu portrays the story of highly aspiring youngsters who are conned by a software company director into giving up their project at no cost. The film shows the revenge of all these youngsters who make the director think that he has been kidnapped without actually kidnapping him. The hilarious making up of the story with a wonderful screenplay and comedy from the veterans, this movie is a delight to watch on a splendid Saturday afternoon. Set in the special, sensible and calm Godavari backdrop, this Telugu film is the story of a young tailor who aims to become a fashion designer. The film portrays the big dreams of a small town youngster and the ways he tries to achieve it. With some sentiment, drama and a whole lot of entertainment, this film is a worthy watch for the audience. The film stars Sumanth Ashwin in the lead character with three actresses, Anisha Ambrose, Manali Rathod, and Manasa Himavarsha, in the lead roles. Music from the maestro Mani Sharma is an added asset to the film. Comedian Srinivas Reddy who is familiar to the Telugu audience with the dozens of films he has acted in has turned into a lead actor with this film. The film which is directed by Shiva Raj Kanumuri portrays the story of a shy introvert who gets a job and falls in love with a girl. Determined to get married and to impress his boss to get a transfer at the same time he is held back by his shy introverted nature. Will he be able to overcome all the obstacles and succeed in his goal? That will make up for the extraordinary 2 hours of film. The film is a true family entertainer comprising of Love, Drama, Sentiment, and inspiration.